Nature doesn’t create new water. It constantly recycles the same water that existed on the planet billions of years ago. This recycling process, known as the hydrologic or water life cycle, works like a giant plumbing system to transport and renew our planet’s water within the closed system of the earth’s atmosphere. Operating since the beginning of time, the hydrological cycle describes the movement of water as it passes through three phases: solid, liquid and gas. You’ll find the hydrological cycle hard at work high in our atmosphere as well as several kilometers below the earth’s surface. The cycle operates through a number of natural processes scientists call evaporation, transpiration and precipitation. Evaporation describes the change from water as a liquid to water as a vapor. Water evaporated from ocean surfaces combines with water evaporated from freshwater sources such as rivers, lakes and streams to produce clouds. The clouds, in turn, produce precipitation, 78 percent of which falls back into oceans while the remaining 22 percent falls back on land. Transpiration, on the other hand, is the loss of water by plants. Transpiration rates depend upon temperature, humidity and wind speed conditions near the leaves of plants. And since plants draw water from the soil, transpiration rates can greatly effect soil moisture content. Soil water loss resulting from both transpiration and evaporation is called evapotranspiration. 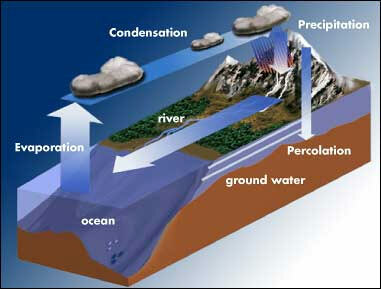 When precipitation reaches the ground, it follows two basic pathways: surface flow and infiltration. As water soaks into the subsurface through infiltration, it moves through the pores of the soil until the soil reaches saturation. Once infiltrated, water continues to filter through soil or rock through vertical movement called percolation. Percolation results in the movement of water from the soil layer to groundwater. Underground formations that contain groundwater are called aquifers.